I have just finished reading the most amazing book, and I just had to share it with you! 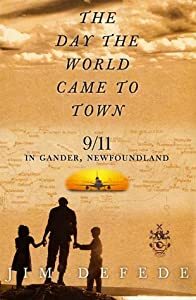 The Day The World Came To Town: 9/11 in Gander, Newfoundland by Jim Defede, is an absolute read. “When thirty-eight jetliners bound for the United States were forced to land in Gander, Newfoundland, on September 11, 2001, due to the closing of the United States airspace, the citizens of this small community and surround towns were called upon to care for the thousands of distraught travelers. Their response to the challenge was truly extraordinary. Oz Fudge, the town constable, searched all over Gander for a flight-crew member so that he could giver her a hug as a favor to her sister, who managed to reach him by phone. Eithne Smith, an elementary-school teacher, helped the passengers sheltered at her school fax letters to loved ones all over the world. And members of a local animal protection agency crawled into the cargo holds of the jets to feed and care for all of the animals on the flights. I cannot add more about this book, except to say that I highly recommend everyone read this book! Very uplifting, so many stories … Definitely, a must-read!! I’ve read so many books about 9/11, but not this one. I just downloaded a sample onto my Kindle; if I like it – and it sounds like I will – I’ll purchase it. The title also reminds me that innocent people from over 90 countries were killed that day. Thank you from an avid reader for this recommendation. It’s the only book I’ve ever reviewed. I subscribe to scribd, which gave me full access to the book. However, it was so good that I ordered a pager back version of it. I’m certainly not sorry I did. 9/11 as your birthday? Like the title so far. I’ll check the library and thank you for the recommendation. This is on my list. A very good friend of mine was on a flight back to New York that day, she landed in Newfoundland. Her building was across the street from the towers, the towers demolished her building, luckily, all of the 6 staff left in the building got out in time, I was in Ottawa working, it was a surreal day. Ah, Michelle, it’s been a long time since I’ve read not only such a good read, but I read it pretty fast, too. I hope you get around to reading it! I read the book today! What a fabulous story. I had a feeling that once you started it, you would find it hard to put it down! And it is a wonderful story, I agree!